That, if you can't tell, is a box of comics. There were a hundred of them in there when the picture was taken, and if you're reading this it means, at this early stage, that you have probably read one of them. That's right, this is a photograph of a comic you've read, back before it ever ventured inside a comic shop. There, already I've made it worth your while following that link on the back cover, haven't I? No? Well it's all I've got, you're just going to have to lower your expectations or something. Go on, lower them now, and then we can carry on. 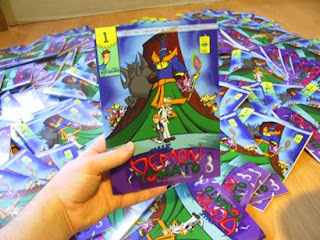 Now you've done that, you'll be very excited to hear that those are one hundred copies of the same issue of the same comic, The Demon Tomato #1, and that I have a box full of it because I made it! I think it's safe to say that most people whose job it is to write or draw comics has a Pet Project, the sort of thing they think of as Their Main Thing, that we work on (or, more usually, plan to work on) between jobs. This is mine. We have to try and stop ourselves from talking about these, because we almost always end up sounding mad or delusional, talking about what sounds to everyone else like some daft old nonsense, but calling it "my real stuff," or, "my personal work." I've caught myself saying similar things myself, but if I ever say it to you, don't believe me. This isn't in any way real or serious, it is precisely some daft old nonsense. But I reckon there are enough people who like daft nonsense to warrant my going ahead and making it anyway. Yep, this box is the result of what should have been a few weeks' doodling but (as is often the way) turned out actually to require multiple years of drawing, re-drawing, re-imagining, publishing, re-imagining again, re-drawing, re-re-drawing and finally fiddling endlessly with the protoforms of ideas that eventually became The Demon Tomato. And of course, all those years and all those revisions mean I've got what amounts to a fair bit of "behind-the-scenes" gubbins to show anyone tedious enough to be interested in what goes on "behind the scenes" of a man drawing something on a bit of paper. Is that you? Is that how bored you are? Then READ ON! And look at that. This is it fresh out of the box from the printers', looking all glossy and done-up, like a proper comic or something. When your job is to draw pictures for companies - and mine is, by the way, I should have said that earlier. I draw or colour or ink things for people, often for kids' magazines like you might find on the shelf in the supermarket - you get used to seeing something you've drawn printed nicely and on professional-looking paper and so on. But when everything in it is yours, not just a few drop-in illustrations, it feels quite different to receive a boxload of it in the post. I heartily recommend it to anyone, and hopefully with future updates I can go on a bit about how to do it. You don't need me to, mind. It's not very tricky in this day and age, the hardest part is bothering to knock together twenty-something pages of artwork (thirty-something, in this case,) busy as we can all be. 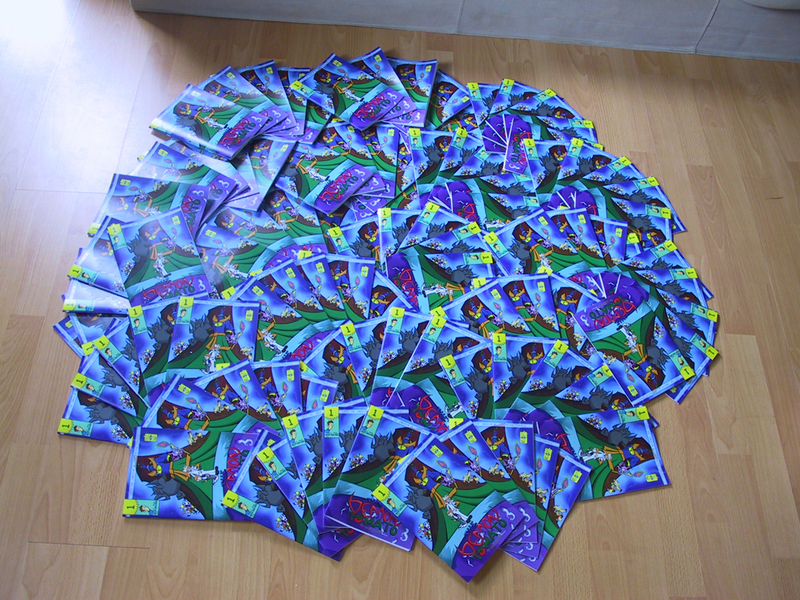 But maybe if I talk about how I did it, the next comics genius might read it and realise they could have boxes full of glossy copies of their own pet project by now. And then they'll produce lavish pages of exquisite artwork, and it will break records and we'll all love it, and mine will look like utter rubbish in comparison and then I'll probably wish I'd kept my mouth shut in the first place.